I love it when I can help people find their next vehicle. Just in the last few weeks, I got my mom into a G35, my friend Jack into an RSX, and now my friend Michael picked up a Vigor. Just call me the automotive matchmaker. Several months ago, a guy named Michael from Tulsa commented on the key-handoff Instagram photo of my 1994 Vigor GS that I’d posted. He mentioned that he wanted me to let me him know if I saw any similar cars/deals. We corresponded via Direct Message a bit, eventually became text buddies, and then Facebook friends. And finally this weekend, we became friends in real life. 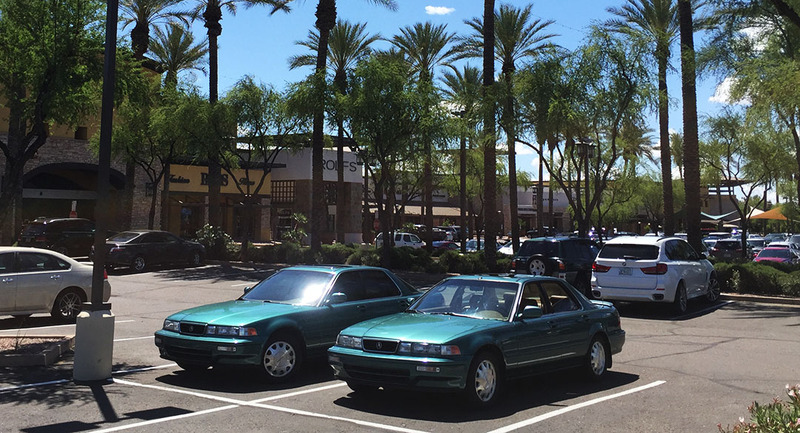 All because of a 22-year-old Acura that we both have a soft spot for! As it turns out, Michael’s first car was supposed to be a black Acura Vigor but his dad wouldn’t let it happen. So now many years later, Michael bought one after all. He says he’s going to park it in his dad’s driveway as a surprise. The car Michael bought is this twin to mine that I blogged about a few weeks ago. This Vigor will be a combination restoration project / daily driver / get-around toy. Michael already has a Toyota Tacoma and Toyota MR2 in his fleet back home in Oklahoma. 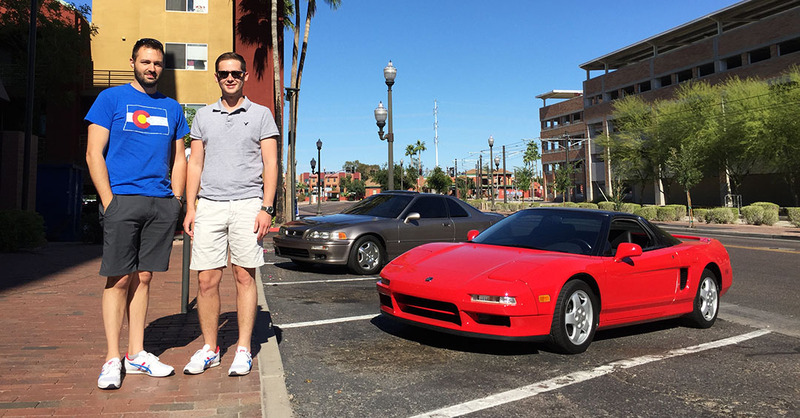 Michael, his friend Chris, and I took the Legend coupe & the NSX to breakfast in Tempe, Arizona on a beautiful Saturday morning. This was their first time visiting the state so I felt a duty and obligation to show them some decent food and sights during their very short (< 24 hour) visit to the state. We had omelets at NCOUNTER, then cruised up to the Vigor seller’s house in North Scottsdale. It took about 30 minutes to get through the purchase paperwork and get on the road in our tandem “Vigs.” Michael was enough to share with me a spare set of “cognac”-colored floor mats since the car came with multiple sets. The seller had also included boxes full of spare parts and a several quarts of Honda transmission fluid. He’d done all his own maintenance over the years so he knew just about every nut and bolt of the car. He kissed the hood just before Michael drove away. That’s how you know someone took good care of their car and will miss it! 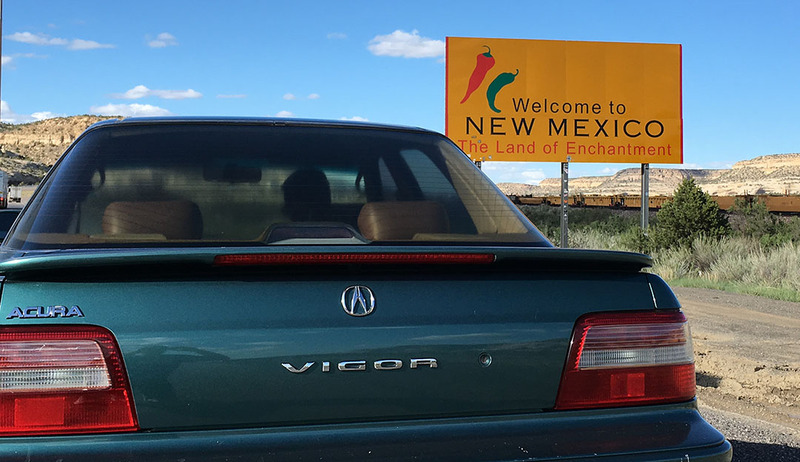 Michael sent me an update from the New Mexico state line as he was midway through his 1,025-mile drive home to Tulsa. Here’s a short video documenting his purchase & send-off. 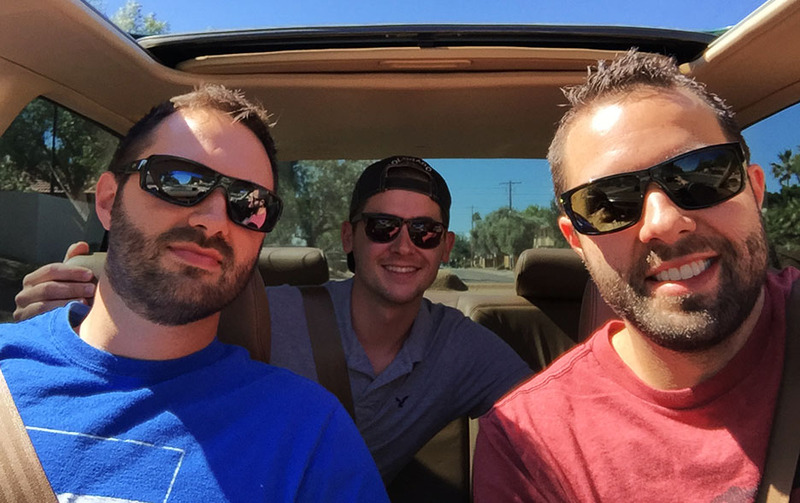 Leaving AZ (for good!) and heading eastward. I hosted several friends yesterday for a car wash. Every once in awhile, I clear out the garage and driveway and invite people to come over and shine up their rides. I don’t claim to be any sort of detailing expert, but the basics are a piece of cake. We shined up Kevin’s Ford Escape, Ryan’s Lexus IS350, Jack’s RSX, Chandler’s Genesis, Michael’s Mini Cooper, and my ILX. Couldn’t have asked for a better way to spend an 85-degree day. Oh, and Jack wanted a “douche bag” photo so we had to flex for one. Here’s a video showing some of the moments. Love the color on Kevin’s Escape. James caught this picture of me at dinner last Tuesday. 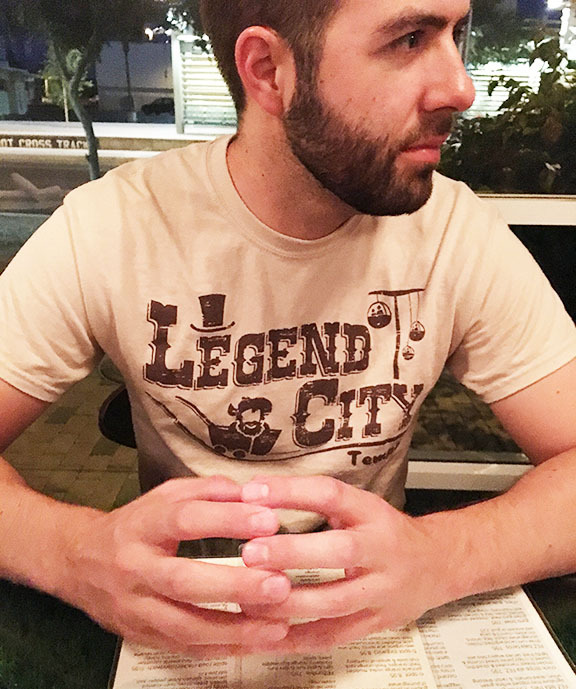 Legend City! Finally: Check out this neat paperwork I came across. I can’t remember where on the Internet I found it originally. So the new 2017 Acura NSX is finally on sale, right? I don’t think anyone has taken delivery yet, but the configurator online at Acura.com is “live” and orders are being placed (supposedly). But are people going to be paying OVER sticker price for the car due to high demand? That’s what happened with the original NSX. Look at the next 2 documents. First one is the monroney sticker for a 1991 NSX. $61,600. But here’s where it gets interesting. Look at the markup this dealership put on the car. Last line item reads: “ADJUSTED MARKET VALUE: $30,000.” Seriously! And remember, this was 25 years ago! 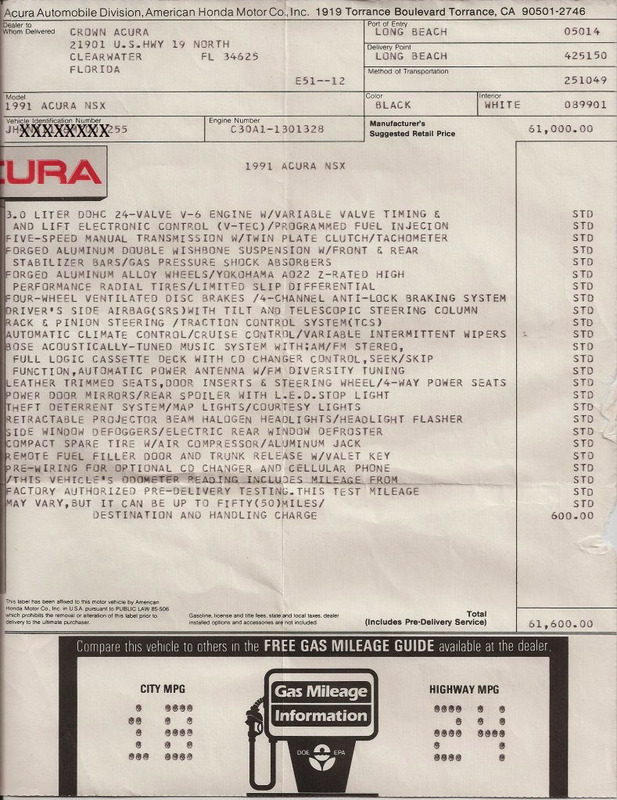 A $30,000 markup in 1991 translates $53,032 markup in 2016 dollars. Pretty wild. But clearly they had no problem selling NSXs back then, even at a premium price. Or did they? Were any of my readers in the market back then to know? Chime in. This entry was posted on May 9, 2016 at 5:06 pm and is filed under Arizona, Vigor. You can follow any responses to this entry through the RSS 2.0 feed. You can leave a response, or trackback from your own site. Now, Tyson… Find me an NSX! Too bad Acura didn’t see this much love back during the Vigor’s heyday than maybe it could have lasted longer than 2 model years. BTW Tyson here is a speculative question based on rarity which will be more “collectible” the Vigor or ZDX? I can’t tell you the last time I saw a ZDX! They’re such angular vehicles – a friend of mine says they look like a platypus. In a sense I think the ZDX was a little ahead of its time. The world wasn’t ready for a $50k crossover yet. Who knows! I’ll see if I can dig up sales numbers. It would be really interesting to see how many units it sold during its 4 year lifespan. Not many, that’s for sure. Hope you had a nice weekend! I found it. 6,117 ZDX sold. Vigor sold over 44,000 during about the same lifetime. ZDX is destined to be a collector item! Should’ve swapped trunk lids with Michael! I know! He liked the spoiler so we didn’t want to complicate things. Would have been sweet though. At least I got my hands on an extra set of floor mats! !